At Elliot Oliver we really do care, we work hard at being a responsible business, our values are at the core of who we are,­ we take care of our clients, and go that extra mile, but we also take care of our colleagues and our local community! 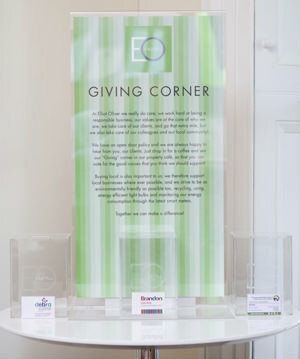 Being a responsible business is about taking care of people and the planet which equates to profit, and we strive to be good employers, and kind to the environment, and support those in need locally, charity starts at home! Our chosen charities for this year are the Brandon Trust, DEBRA and the Cheltenham Animal Shelter and we allow our staff to volunteer on a regular basis. We have an open door policy and we are always happy to hear from you, our clients. 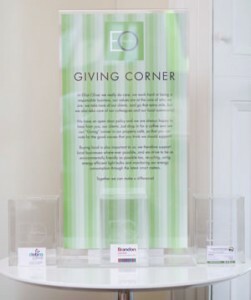 Just drop in for a coffee and see our “Giving” corner in our property café, so that you can vote for the good causes that you think we should support! Buying local is also important to us; we therefore support local businesses where ever possible, and we strive to be as environmentally friendly as possible too, recycling, using energy efficient light bulbs and monitoring our energy consumption through the latest smart meters.